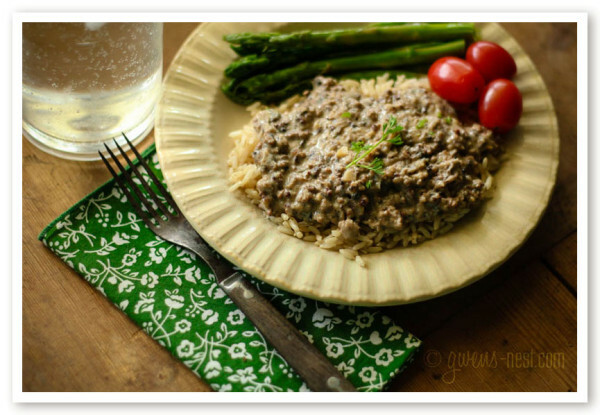 This ground Beef Stroganoff has been a favorite of mine since I was a little girl. It’s one of those classics that my Mom taught me how to make, and it still gets frequent requests around my own dinner table. Growing up, we made this dish with a can of cream of mushroom soup and a whole carton of sour cream. I’ve created a healthier, lighter version that’s JUST as flavorful. If you’re a Trim Healthy Mama, you may use full fat sour cream to create a crossover meal, or use the lower fat version to create a filling E dinner when served over brown rice. I know lots of you are wanting ideas for good E meals. Give this one a try! 1 pound of ground beef, a few cloves of garlic, one onion, a mushroom soup cube, 1 cup of unsweetened almond milk (or other dairy free, low fat alternative), 0% Greek yogurt, and glucomannan and a tablespoon of butter (not pictured). I like to serve this over brown rice, so that’s already in the cooker at this point. Step one: Melt butter, and saute chopped up onion in a skillet until tender. Toss in chopped garlic for just a minute or so, and then add your beef. I like to brown my beef well…I like some dark brown crusty spots on the bottom. It adds such a rich beefy flavor! Measure out 1/2-1 tsp of gluccomannan, and get your whisk ready. Sprinkle a light layer of gluccie over the top of the milk as you whisk. You should see it start pulling together into a rich, thick sauce. I start with 1/2 t. and go from there. Add your 0% Greek yogurt to the pan next. Stir to blend it all in. Add salt/pepper to taste and adjust seasonings to your liking. Serve over brown rice with a side of steamed veggies or a side salad. 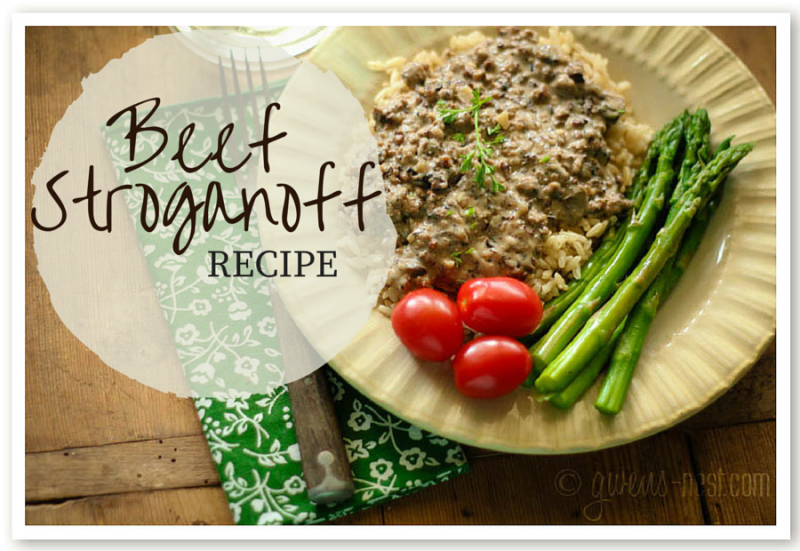 Beef Stroganoff Recipe - E Style! This is another fast family favorite that we would really eat every week. It's a filling and delicious E meal to fuel your metabolism. If you'd prefer to make it an S meal, then sub for real sour cream, and serve over Dreamfields pasta instead of rice. Add ground beef, and brown. Cook the beef until a toasty brown develops on the bottom of some of the meat, and it has a rich, roasted smell. Transfer meat to colander, and rinse with very hot water to remove fat. This step can be skipped if you are using a very lean grassfed beef or venison...if in doubt, just rinse. Chop up the onions and garlic. Melt butter in a skillet over medium heat. Cook onions in butter for a minute, and then add garlic and stir. Make a hole in the center of the skillet, and melt down a cream of mushroom soup cube. Pour your cup of almond milk over this, and gently sprinkle the gluccomannan into a thin layer over the liquid, whisking as you sprinkle. Stir until it comes together into a gravy. Stir in Sour Cream and seasonings to taste. Blend in well and cook until warmed through. To create a Crossover meal, serve with an S side dish or dessert, &/or use full fat sour cream in place of the Greek yogurt. For more Trim & Healthy inspiration, check out the Trim Healthy Tuesday link up on page 2! We had this tonight for dinner. So yummy! Definitely a keeper! Thanks for this recipe…. When you say “add sour cream” in the recipe, you mean yogurt subbing for sour cream, right? Will be trying this….have never subbed yogurt for sour cream but I’m sure it’s just as good. Yes…thank you! The 0% Greek yogurt tastes almost *exactly* like Sour Cream to me. It’s really a fantastic sub. Can you use sour cream instead? Are the calories and nut. Info just as good, or is yogurt more superior to use? Thanks! So could I make this without the cream of mushroom cubes? I thought ground beef was an automatic S meal? If you rinse it after browning, it becomes lean enough to use for E meals. Cool, huh! I have always boiled my ground beef, instead of frying it. Gets the grease out. Just strain it & dump it back into your pan. The meat will be a light brown so you’ll know it’s done. Hint: Put on a “rubber” glove & squish it in warm water to mix it easily & then your hand stays clean, & it’s super easy. I thought a tablespoon of butter is an S meal. This website is very confusing. Hi Cheryl, I’m sorry you’re confused. A Tablespoon of butter would not be a problem in a meal that has many servings…you’d just want around a teaspoon of fat max per serving to stay in E territory for your meal. What can I use if I don’t have one of your cubes for the mushroom? I thought beef was always an S?? This looks promising! Where can I find mushroom soup cubes? Did you freeze some, or are they like bullion cubes? The recipe looks great! If I wanted to make this a ‘S’ meal, what brands/kinds of noodles should I use? 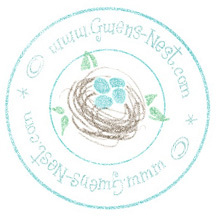 Thank you – looks lovely! If you’re doing the THM plan, then you could use Dreamfield’s pasta to keep it in an S setting. Could I just use corn starch? My glucci hasn’t come in yet. Corn starch works really well as a thickener, but it’s pure starch, so it will bump up your carbs a bit. Gluccie won’t. I’d probably opt to use sprouted flour if you have that on hand as a thickener. This looks really good! Would you need to rinse the ground beef to remove excess fat to make it an E? Also, where would you find a mushroom cube and/or what could you use in replace of? TIA! This looks yummy. Thank you for posting this. My question is this, and please be mindful of my ignorance as I am fairly new to the THM way. Why is this an E and not and S? I was thinking that the fat in the burger would make it too high to be an E.
E (energizing) meals are fueled by healthy carb sources. With the brown rice, this would definitely fall into E territory. You’re right to be thinking of fat content, but since the recipes suggests rinsing the beef once it’s cooked, that brings the fat into range. Hope that helps! Is there anything that could be subbed for the mushroom cube? We have a mushroom-free house (the hubs can’t have them) but I would love to try this recipe! I am having such a hard time with E meals. Just omit if you don’t care for mushrooms…it’s just a flavoring option. 🙂 You can add other herbs or diced or caramelized onions to add flavor if you want. Would it still be an Email if you used rice cauliflower? Well, the rice adds the healthy carb component that takes it into E territory. If you added another source of healthy carbs, like a piece of fruit, then it could still stay an E with cauli-rice. Just made this for dinner tonight. Mine was bland. Since you didn’t say what steak seasoning you used, I thought perhaps I used the wrong brand. I bought Weber Chicago Steak seasoning–could this have resulted in the bland taste? I used the McCormick Grill Mates seasoning. And I am a “season to taste” girl when I cook. 🙂 So if it’s too bland, just add more to taste.